Order your custom-made satellite picture here! We offer more formats than those that are possible with the aid of the map. We can make possible every imaginable format. Talk to us about your requests. Do not hesitate and contact us today. SHOWS THE WEST MACDONNELL RANGES IN PURPLE. ALICE SPRINGS CAN BE DISCERNED NEAR THE ORANGE SHIMMER. THIS INFRARED FALSE-COLOR COMPOSITE SHOWS THE MISSISSIPPI DELTA IN THE USA, WHICH FLOWS INTO THE GULF OF MEXICO. THE FIRST FALSE-COLOR COMPOSITE SHOWS A PART OF THE SWAMPLAND AROUND THE RÍO PARANÁ, SHORTLY BEFORE IT FLOWS INTO THE RÍO DE LA PLATA. THE SECOND COMPOSITION DEPICTS ISLANDS IN THE ATLANTIC OCEAN OFF THE COAST OF GUINEA-BISSAU. THIS TRUE-COLOR COMPOSITE SHOWS THE ATLANTIC COAST OF GUINEA-BISSAU. 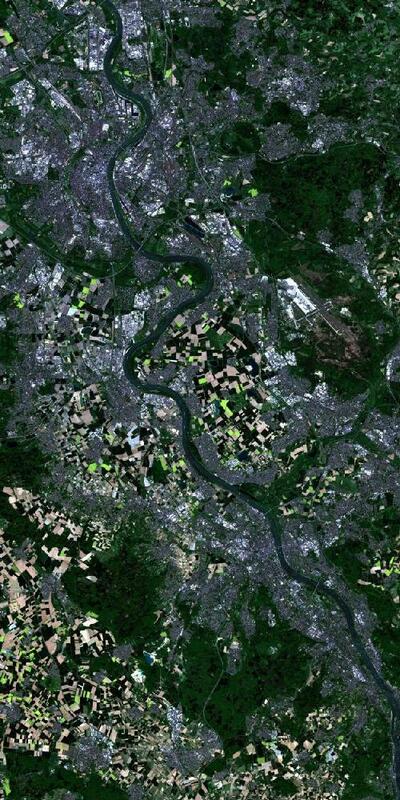 THIS TRUE-COLOR COMPOSITE WAS PHOTOGRAPHED IN MAY 2016 AND SHOWS COLOGNE IN THE NORTH AND BONN IN THE SOUTH. THE RHINE FLOWS PROMINENTLY FROM SOUTHEAST TO NORTHWEST. ALSO VISIBLE IS THE COLOGNE BONN AIRPOR(CGN). ON CLOSER INSPECTION, AN AIRPLANE APPEARS IN RED, GREEN AND BLUE, CREATING THE IMPRESSION OF THREE DISTINCT AIRPLANES. THIS EFFECT OCCURS BECAUSE OBJECTS AT THAT HEIGHT CANNOT BE CO-REGISTERED CORRECTLY IN SATELLITE IMAGES. Let yourself be inspired or choose your own map section here. THIS FALSE-COLOR COMPOSITE FROM DECEMBER 2015 SHOWS BUENOS AIRES AT THE EDGE OF THE RÍO DE LA PLATA, AS WELL AS PARTS OF URUGUAY AND ARGENTINA, WHOSE NATURAL BORDER IS DEFINED BY THE RÍO URUGUAY. THE SWAMPLAND OF THE RÍO PARANÁ IS DEPICTED IN PARTICULARLY IMPRESSIVE SHADES OF BLUE. THIS FALSE-COLOR COMPOSITE WAS PHOTOGRAPHED IN DECEMBER 2015 AND SHOWS A SEGMENT OF THE PICTURE “ARGENTINA”. 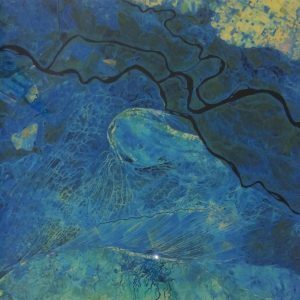 IT DEPICTS AREAS OF SWAMPLAND AND THE RÍO PARANÁ, SHORTLY BEFORE IT FLOWS INTO THE RÍO DE LA PLATA. THIS FALSE-COLOR COMPOSITE FROM JANUARY 2016 SHOWS THE SOUTH-WEST OF THE NORTHERN TERRITORY IN AUSTRALIA. IN THE SOUTH, THE FINKE GORGE NATIONAL PARK IS DEPICTED IN DARK GREEN, WHILE THE PICTURE’S CENTER SHOWS THE WEST MACDONNELL RANGES IN PURPLE. ALICE SPRINGS CAN BE DISCERNED NEAR THE ORANGE SHIMMER. THIS FALSE-COLOR COMPOSITE SHOWS SOSSUSVLEI IN THE NAMIB DESERT IN NAMIBIA – A SALT PAN SURROUNDED BY NAMIB SAND DUNES. THIS NATURAL COLOR COMPOSITE DEPICTS THE ISLANDS ILHA DE ORANGO, ILHA DE UNO, ILHA DE UNHOCOMO AND ILHA DE URACANE IN THE ATLANTIC OCEAN OFF THE COAST OF GUINEA-BISSAU. THIS FALSE-COLOR COMPOSITE SHOWS THE EAST FRISIAN ISLANDS IN THE NORTH SEA OFF THE COAST OF EAST FRISIA IN LOWER SAXONY, GERMANY. ON THIS FALSE-COLOR COMPOSITE ONE CAN DISCERN CAPE TOWN, THE CAPE OF GOOD HOPE AND THE THEEWATERSKLOOF DAM IN SOUTH AFRICA. THIS FALSE-COLOR COMPOSITE SHOWS THE MACDONNEL RANGES IN THE NORTHERN TERRITORY OF AUSTRALIA. 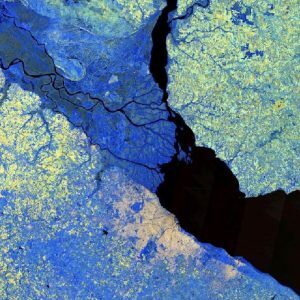 THIS FALSE-COLOR COMPOSITE DEPICTS THE COURSE OF A RIVER IN IRKUTSK OBLAST IN RUSSIA. THIS FALSE-COLOR COMPOSITE SHOWS PARTS OF THE NAMIB AND THE NAUKLUFT MOUNTAIN ZEBRA PARK IN NAMIBIA. THIS FALSE-COLOR COMPOSITE SHOWS TRÊS LAGOAS IN BRAZIL AND THE SURROUNDING AREA. We offer more formats than those that are possible with the aid of the map! We can make possible every imaginable format. Talk to us about your requests. *Our prices include the legal value added tax (VAT) as well as the image optimization of colours and contrasts. Depending on the desired motif, the available image material and any special customer requests that may exist, (where appropriate also complex) image processing and retouching may be necessary. These are not included in the stated prices and are offered and billed as additional services in consultation with the customer. Other materials You have further requests? Please contact us! You have further requests? Please contact us!